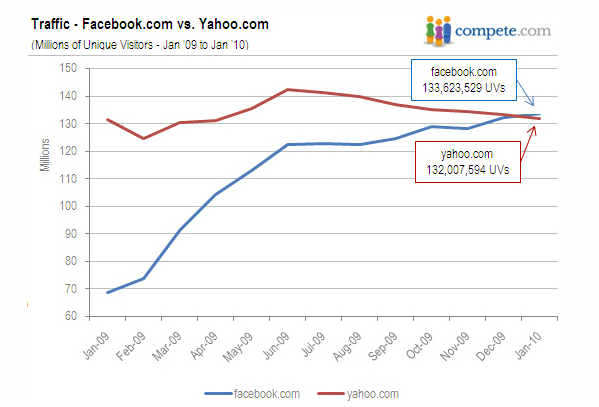 When you hear that Facebook is yanking Yahoo from its ranks and inching up on Google’s traffic throne, you can’t help but pay attention. And if you work for a business or own one, it’s likely that social media marketing is on your radar. More and more marketing dollars are beginning to shift toward social media marketing and this trend only continues to climb. Here are 5 studies that show how Facebook is undoubtedly a leading online social contender and a key tool that is continually changing the landscape of online engagement and fan loyalty. The average time users spend on Facebook is 7 hours per month (a 10% increase). To put that into perspective, Yahoo! is in second place, but with only 2 hours 28 minutes per month. 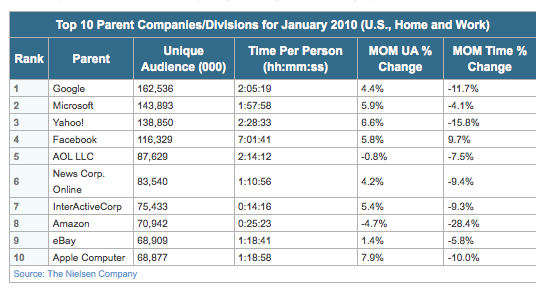 The fact that people are spending more than 4 hours extra on Facebook compared to leading sites like Yahoo! and Google is information marketers should note when creating their social media campaigns. With the surge of social networking over the past year, we have seen social traffic begin to rival search traffic—and the major players, including Google, are paying close attention to this trend. 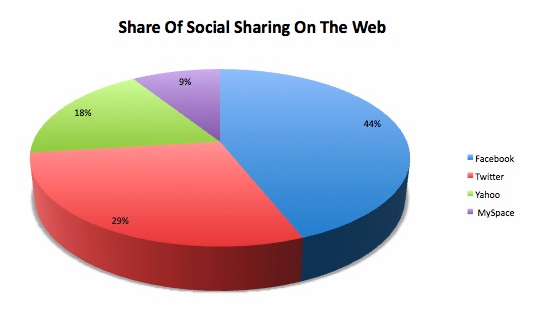 For share of authentication via news sites, Facebook took 31% while Google was close behind with 30% and Yahoo at 25%. With entertainment sites, Facebook was the major leader with 52% (Google was second with 17%, Yahoo with 15% and Twitter at 11%). As we have seen with the popularity of social sites, people like to share links with multiple people at one time, versus just one-on-one via email. Because real results are strongly tied to the amount of online traffic you’re able to generate, it’s important to break down the sources of this traffic when considering where to spend your time and marketing dollars. These stats shed light on where the action is really happening. But as we all know, the real dollars are in the engagement—and Compete.com says it best: “Facebook is second to none.” In January, 11.6% of all time spent online was spent on Facebook (compared to 4.25% for Yahoo and 4.1% for Google). Facebook is in it to win, to say the least! The findings from a recent research study conducted by the journal Psychological Science, show that instead of “faking it” online, people are much more likely to reveal their true selves online and not the idealized image of who they want to be. Three months after that, they resurveyed the fans and here’s the overall result: Facebook changed customer behavior for the better. Store visits per month increased after people became fans. The new fans generated more positive word of mouth than nonfans. They went to DG 20% more often than nonfans. Fans gave the store the highest share of their overall dining-out dollars. They were the most likely to recommend DG to friends and had the highest average Net Promoter Score—75, compared with 53 for Facebook users who were not fans and 66 for customers not on Facebook. DG fans also reported significantly greater emotional attachment to DG—3.4 on a 4-point scale, compared with 3.0 for other customers. Fans were the most likely to say they chose DG over other establishments whenever possible. But overall, Dholakia stated that the results indicate that Facebook fan pages offer an effective and low-cost way of social media marketing. Your insight and opinion matter! What is your opinion of the “power of Facebook”? Do you agree or are you not seeing the same success rates as these studies suggest? Do you favor another social media tool over Facebook? I want to hear your insight, so be sure to share here!